Yippee Skippie! Ron and I got up early for the Midway Volunteer Fire Dept. Auxilary fund raising garage sale. Their twice a year sale usually turns into a great place to find vintage fabrics. This sale was no exception. I came home with this vintage top that measures 68 x 83 and is in great condition. I have found one square with a rip that is repairable along one edge. The fabrics are all crisp and unwashed. The pieces that drew my attention were all the persimmon colored linen squares. This is one of my favorite colors that shows up in many of my art quilts. I wanted to show a close up of a few blocks. I love the use of stripes and polka dots in this one. The maker was so free that the directions of the stripes are all random. Do you see the sticker and the little black dot? That dot means I paid $10 for this beauty. I love the black prints in this block. Sort of reminds you of Halloween doesn’t it? Many quilts evoke feelings of seasons and this one is a fall quilt for sure. 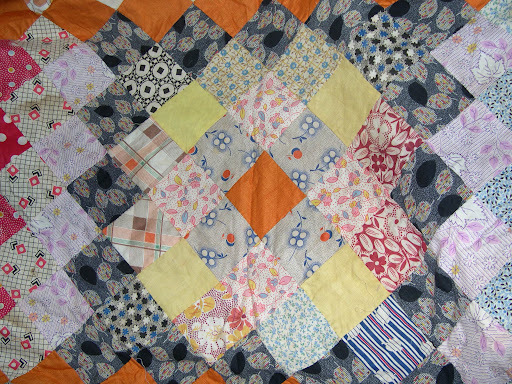 The edges of the quilt are framed with black print triangles. You must have a magnet in your fingertips that attracts bargains! That is a great quilt top. Okay, isthe 2 reams of vintage cotton rag onion paper or what?? Something I have not heard of unless it is what we always called Rag Paper. Love seeing your 'finds'!!! You'll always come back with something great!!! Brenda, onion skin paper is thin like an onion skin. In the old days we used it for carbon copies. I printed a photo on some, sprayed it with a fixative and then used gel medium to adhere it to cloth. Very cool! 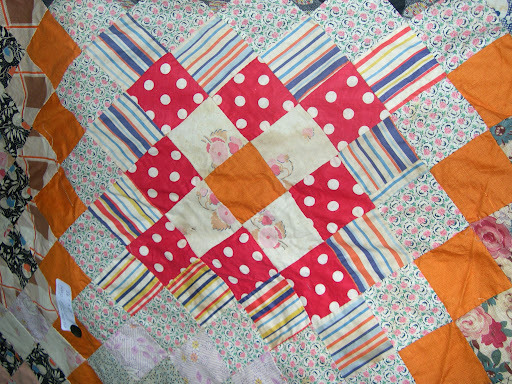 Charming quilt top – but it's the onionskin paper that makes me envious. My supplies – a box saved from a cupboard clear-out at work at least 10 years ago – are all but gone! I'm jealous! 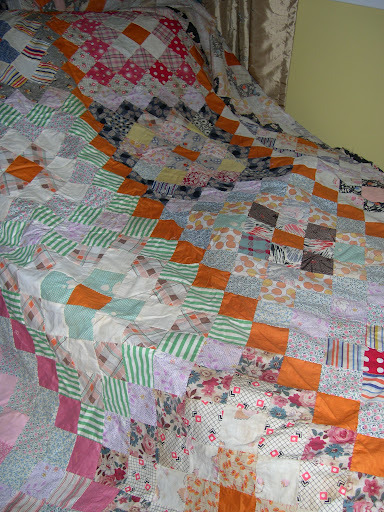 What a great quilt top, and the orange is the icing on the cake!